Apoptosis plays a major role in normal organism development, tissue homeostasis, and removal of damaged cells and is caused by the activation of proteolytic enzymes termed caspases. Proteins that comprise the Bcl-2 family appear to control the activation of these enzymes. One such protein BIK was recently identified as an endoplasmic reticulum (ER)-residing pro-apoptotic member of the Bcl-2 homology domain-3 (BH3)-only group of the Bcl-2 family that stimulates mitochondrial release of cytochrome c following p53 induction of apoptosis. A significant fraction of BIK is found as an ER transmembrane protein, with most of the protein facing the cytosol. Restricting BIK to the ER membrane by replacing the transmembrane region with that of the ER-selective membrane anchor of cytochrome b(5) resulted in a decreased cytochrome c release from mitochondria and a corresponding drop in cell death. Recent evidence suggests that BIK cooperates with NOXA, another BH3-only protein, to somehow enhance the activation of Bax to stimulate the rapid release of cytochrome c from mitochondria. 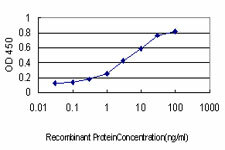 Detection limit for recombinant GST tagged BIK is approximately 0.03ng/ml as a capture antibody. 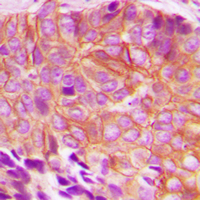 Immunohistochemical analysis in paraffin-embedded human lung carcinoma tissue using BIK antibody (Cat.-No. AP06031PU-N). Western blot (WB) analysis of BIK antibody (Cat.-No. 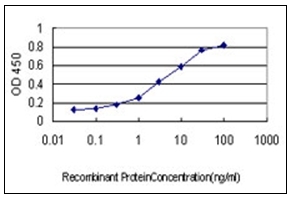 : AP06031PU-N) in extracts from A549 cell treated with DMSO 0.1% 10'. Figure 1. Formalin-Fixed Paraffin-Embedded (FFPE) on Prostate. 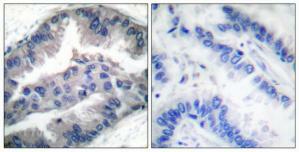 Formalin-fixed, paraffin-embedded tissue section of human kidney stained for BIK expression. Using BIK polyclonal antibody ( Cat # PAB0239 ) at 1 : 2000. A high level of BIK signal was seen in the distal collecting tubules, the glomeruli are primarily negative. Hematoxylin-eosin counterstain. 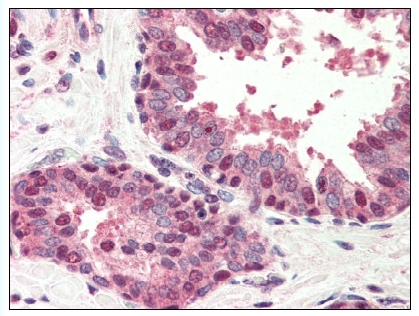 Formalin-fixed and paraffin-embedded human cancer tissue reacted with the BIK polyclonal antibody ( Cat # PAB2449 ) , which was peroxidase-conjugated to the secondary antibody, followed by AEC staining. This data demonstrates the use of this antibody for immunohistochemistry ; clinical relevance has not been evaluated. 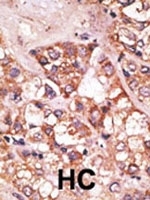 HC = hepatocarcinoma. The BIK polyclonal antibody ( Cat # PAB2449 ) is used in Western blot to detect BIK in mouse brain tissue lysate. 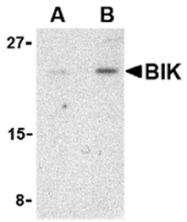 Western blot analysis using anti-Bik BH3 domain Pab (Cat. #AP11315PU-N) to detect Bik BH3 in mouse brain tissue lysate. 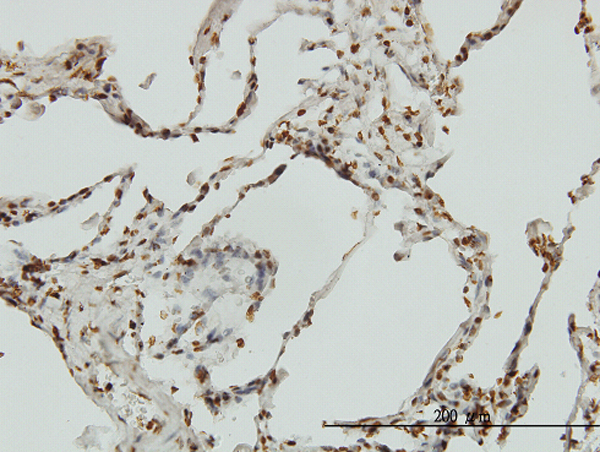 AP12573PU-N BIK antibody staining of Formalin-Fixed and Paraffin-Embedded Human cancer tissue. 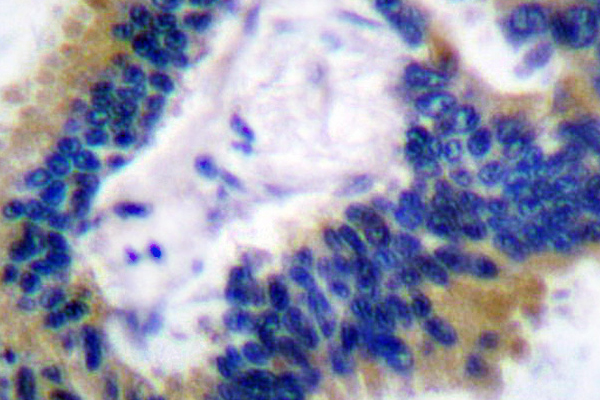 The primary antibody, which was peroxidase-conjugated to the secondary antibody, followed by AEC staining. This data demonstrates the use of this antibody for immunohistochemistry; clinical relevance has not been evaluated. Western blot analysis of anti-Bik Pab (Cat.#AP12573PU-N) in mouse liver tissue lysate (35ug/lane). Bik(arrow) was detected using the purified Pab (1:60 dilution). 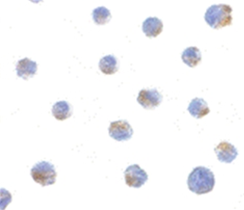 Immunocytochemistry of BIK in Jurkat cells with BIK polyclonal antibody ( Cat # PAB12962 ) at 1 µg/ml. 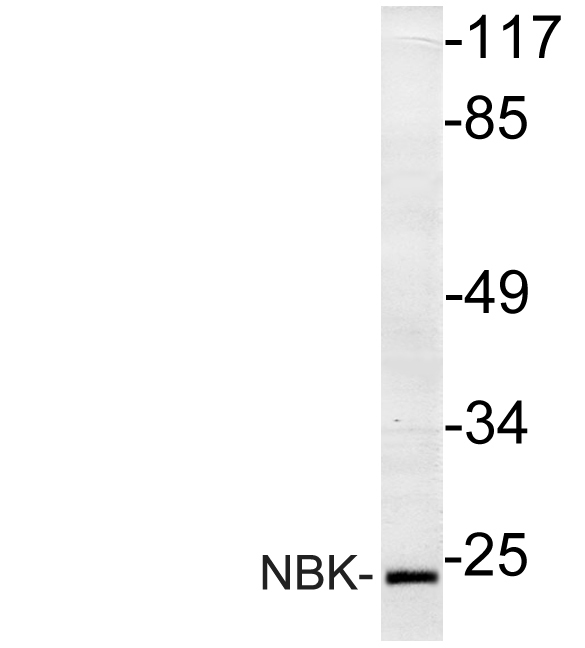 Western blot analysis of BIK in Jurkat cell lysate with BIK polyclonal antibody ( Cat # PAB12962 ) at ( A ) 1 and ( B ) 2 µg/ml. 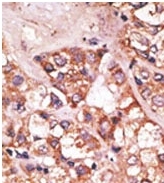 Immunohistochemistry analysis of paraffin-embedded human lung carcinoma, using BIK (Phospho-Thr33) Antibody. The picture on the right is treated with the synthesized peptide. 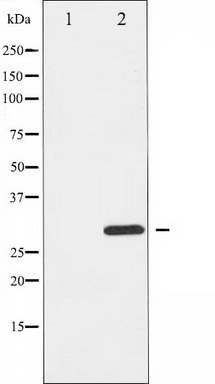 Western blot analysis of extracts from K562 cells, using BIK (Phospho-Thr33) Antibody. The lane on the right is treated with the synthesized peptide. 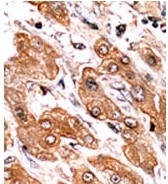 Immunohistochemistry analysis of paraffin-embedded human lung carcinoma tissue, using BIK (Ab-33) Antibody. The picture on the right is treated with the synthesized peptide. 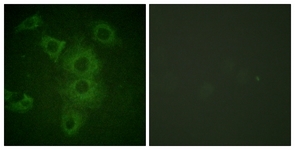 Immunofluorescence analysis of HuvEc cells, using BIK (Ab-33) Antibody. The picture on the right is treated with the synthesized peptide. 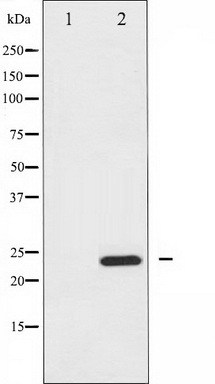 Western blot analysis of extracts from HuvEc/COLO205, using BIK (Ab-33) Antibody. The lane on the right is treated with the synthesized peptide. 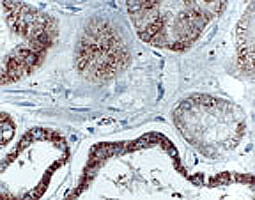 Immunohistochemical analysis of BIK (pT33) staining in human breast cancer formalin fixed paraffin embedded tissue section. The section was pre-treated using heat mediated antigen retrieval with sodium citrate buffer (pH 6.0). The section was then incubated with the antibody at room temperature and detected using an HRP conjugated compact polymer system. DAB was used as the chromogen. The section was then counterstained with haematoxylin and mounted with DPX. Western blot analysis of BIK (pT33) expression in Jarkat (A); K562 (B) whole cell lysates. 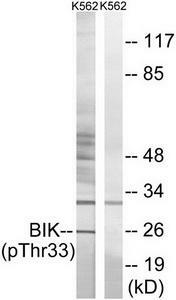 Western blot analysis of BIK in Jurkat cell lysate with BIK antibody at (A) 1 and (B) 2 ug/mL. 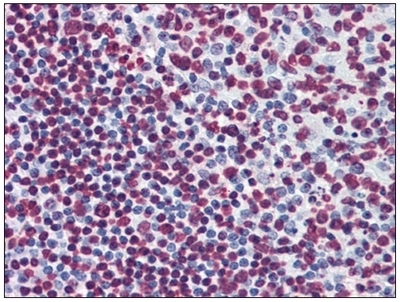 Immunocytochemistry of BIK in Jurkat cells with BIK antibody at 1 ug/mL. 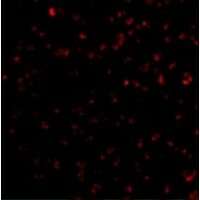 Immunofluorescence of Bik in Jurkat cells with Bik antibody at 10 ug/mL. Western blot analysis of BIK expression in A549 whole cell lysates,The lane on the left is treated with the antigen-specific peptide. 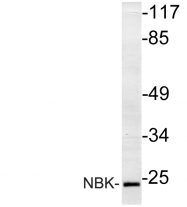 Western blot analysis of BIK phosphorylation expression in HepG2 whole cell lysates,The lane on the left is treated with the antigen-specific peptide. Western blot analysis of extracts from K562 cells, using BIK (Phospho-Thr33) antibody (#TA313505, Line 1 and 2)The lane on the right is treated with the synthesized peptide. 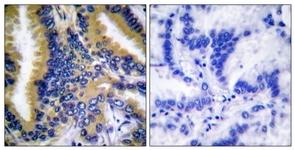 Immunohistochemical analysis of paraffin-embedded human lung carcinoma tissue, using BIK (Phospho-Thr33) antibody (#TA313505)The picture on the right is treated with the synthesized peptide.